Can’t get enough of fall/winter vegetables! Acorn squash is a favorite around here, with its sweet, nutty flavor. It’s versatile and can be roasted, steamed, mashed, or added to soups and stews. I was making pork tenderloin for dinner and thought this would be the perfect sweet side to accompany a savory pork dinner. Plus, a huge green salad, of course! #leafygreensALLday This recipe is also paleo-friendly. If you’re doing a Whole30, yay for you! But make sure you pin this recipe and save it for your post-Whole30 healthy recipe files! Now let’s talk about food, my favorite subject. Acorn squash is awesome. Yes, it’s really high in starchy carbs, with about 90% of the calories coming from carbohydrates. But that’s okay. This is a slow-carb, meaning it won’t cause that drastic spike and crash in blood sugar, especially when you combine it with healthy fat and protein. Also, not all starches are created equal. Winter squashes are mostly made up of polysaccharides, including pectin. Pectin is a type of fiber that supports your body’s detox processes. It helps clear toxins that have been removed from the liver. Like butternut squash, acorn squash is also an excellent source of the antioxidants called carotenes and has important anti-inflammatory properties, as well. And then there’s sage. Sage is such a fascinating herb! It is closely related to rosemary and other members of the mint family. It’s a powerful antioxidant and anti-inflammatory and can be useful for pain management. Some research also suggests that sage can help boost your memory. [2, 3] One important thing to note is that sage can dry up a woman’s milk flow during lactation, so many herbalists recommend that women avoid sage if they are nursing or pregnant. You can remove the sage from this recipe and it will still be delicious. Promise! Place the acorn squash halves on top of a parchment paper or foil-lined baking sheet, cut side up. Coat with avocado oil and generously season with salt. Add a dash of pepper to each half. Place the squash in the oven and set your timer for 35 minutes. While the squash is roasting, in a small bowl, combine the maple syrup, melted butter/ghee, chopped sage leaves and nutmeg. After the squash has roasted for 35 minutes, take it out of the oven. Divide the maple syrup mixture in half, and set half aside. With the other half, coat the acorn squash halves. You can fill the centers of the acorn squash with the mixture also. 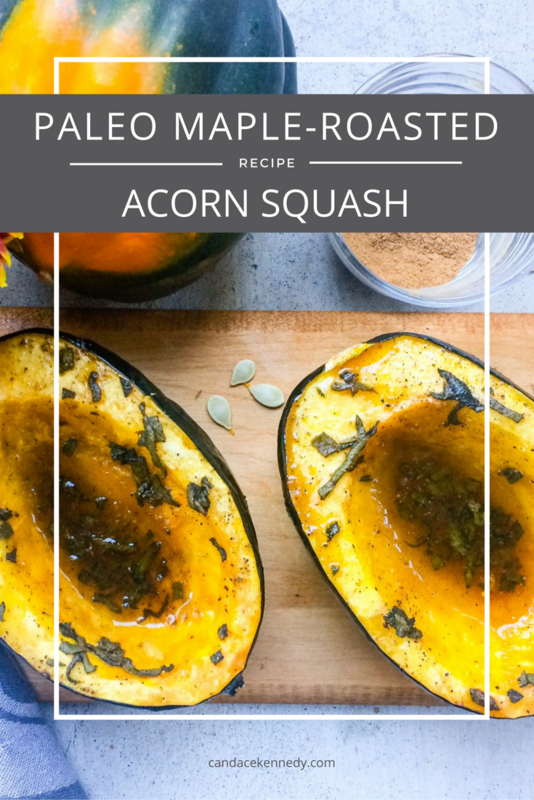 Return the squash to the oven and cook for another 20-30 minutes until the acorn squash is cooked through and you can easily insert a fork. Remove from the oven. When the squash has cooled enough, cut it into slices and top with the remaining half of maple syrup mixture*. 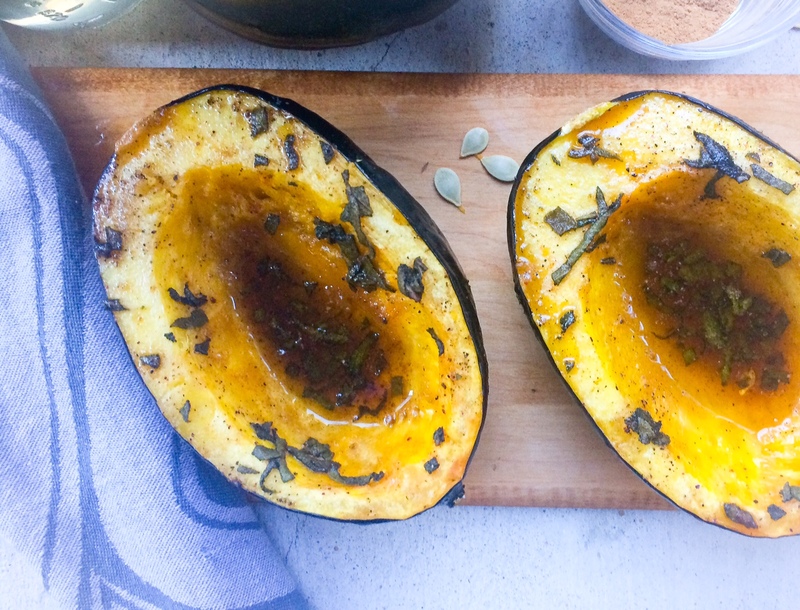 An easy recipe for acorn squash with sage, nutmeg and maple syrup. *You don't have to use all of the maple syrup mixture. You may find that just using the initial half is just sweet enough! Murray, Michael T., Joseph E. Pizzorno, and Lara Pizzorno. The Encyclopedia of Healing Foods. New York: Atria, 2005. Print.